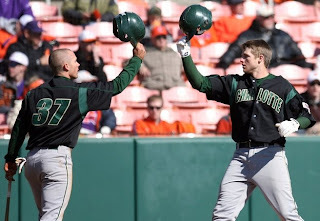 The Charlotte 49ers baseball team won two of three home games over the weekend against Atlantic 10 rival Saint Joseph's to improve to 30-18 on the season. Charlotte, which has won 13 of its past 16 conference games, has won 30 games for five consecutive seasons - a program record. The 49ers also are 20-8 at home this season, the fourth consecutive season of 20 or more home wins, also a program record. Junior infielder Rob Lyerly, making his first start at third base this season on Sunday, had three hits, extending his team-leading hit streak to 18 games, and improved his batting average to a team-best .399 on the season. Charlotte will wrap up its home season on Tuesday when the 49ers host top-ranked North Carolina. The 49ers look to sweep the season series, having already beaten the Tar Heels on March 25 - a 2-1 victory in Chapel Hill. The Niners finish the regular season on the road with three games at A-10 rival St. Bonaventure next weekend. Glad the baseball team is consistent every year unlike basketball! I do believe this is the first time our win against the All Mighty's Chosen Ones in Chapel Hill a month ago has been mentioned in the ACC's Journal of Record (aka Charlotte Observer). Thanks for the mention Utter, we deserved it.